On December 12 and 13, 2018, the Juggling the Middle Ages exhibit at Dumbarton Oaks gave occasion for two more modern encounters with the medieval. A panel discussion of Boutet de Monvel’s Joan of Arc panels at the National Gallery of Art began the lively intellectual exchange; the next day saw Michel Zink draw connections between Anatole France and Gaston Paris, two turn-of-the-century members of the Académie française enthralled by the Middle Ages. Louis Maurice Boutet de Monvel, The Turmoil of Conflict (Joan of Arc series: IV), ca. late 1909–early 1913, oil and gold leaf on canvas. National Gallery of Art, Corcoran Collection (William A. Clark Collection), 2015.19.37. Though best known for his illustrated book Jeanne d’Arc and the larger-scale panels commissioned by senator William A. Clark, now at the NGA, Louis-Maurice Boutet de Monvel (1850–1913) also made a now-lost mural of Joan at the court of Chinon. At the panel discussion at the NGA, Nora Heimann tracked the destiny of this mural, which was deaccessioned from the Art Institute of Chicago and sent to a nearby Catholic church in the 1920s. The diocese eventually sent it to Catholic University of America—Professor Heimann’s home institution!—but it has since vanished. The mystery only deepens when one considers the massive scale of the missing work. Where could it be? Next, Willa Silverman introduced us to the bibliophilia of the early 20th century, which resulted in the flourishing production of new art books that often drew on the Middle Ages for their aesthetic sense and high artisanal quality. She especially focused on the collaboration between the printer Gillot and the illustrator Eugène Grasset. One of their stunning collaborations, an edition of Les Quatre Fils Aymon, can be viewed in the exhibit at Dumbarton Oaks. 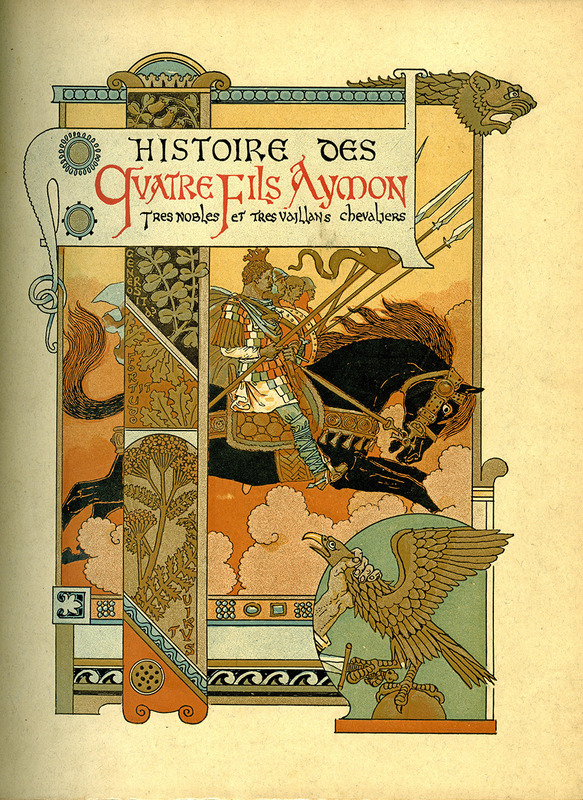 Title page of Histoire des quatre fils Aymon: Tres nobles et tres vaillans chevaliers, edited by Charles Gillot, illustrated by Eugène Grasset (Paris: H. Launette, 1883). Finally, Elizabeth Emery explored how the resurgent interest in Joan of Arc and other medieval people, texts, and artifacts around the turn of the century had roots in the violence of the Franco-Prussian War (1870) and the end of the Commune (1871). In fact, the great monument of 19th-century medievalism, the towering Sacré Coeur in the 18th arrondissement of Paris, found funding by appealing to the people of Paris to redeem the bloodshed of the Commune with a devotional construction project. What’s more, a nationalistic need was felt to revise Gallic history for children to portray the French as unconquered, leading to such books as Boutet de Monvel’s Jeanne d’Arc. The following day, we joined Michel Zink, member and Permanent Secretary of the Académie des Inscriptions et Belles-Lettres (Institut de France) as he discussed the emblematic cultural role(s) of Anatole France and Gaston Paris, elected the same day (May 27, 1896) to the Académie française. Both men were deeply invested in the Middle Ages—France as a source of inspiration for many of his works, including, of course, his version of the Juggler story, and Paris as a professor of medieval French language literature at the Collège de France. To a point, they also shared political convictions: both were Dreyfusards, supporters of the unjustly convicted Alfred Dreyfus in the scandal of justice known as the Dreyfus Affair. (In one crucial moment of the Affair, another medievalist, Paul Meyer, used his paleographic skills to provide crucial testimony about the handwriting in a piece of evidence.) But Zink demonstrated that France’s commitment exceeded Paris’s: France sent back his Légion d’honneur ribbon to protest their treatment of his fellow Dreyfusard, Émile Zola, while Paris, though hesitant, retained his. These two public-facing events deepened our understanding of the figures and objects discussed in the terrific exhibit, Juggling the Middle Ages. I’m so glad to have made the trip to experience the exhibit alongside such a tremendous group of scholars. The exhibit remains open until February 28, 2019: don’t miss it! Hannah Weaver is a PhD candidate in the Department of Romance Languages and Literatures at Harvard University, specializing in medieval literature.